In the past The Church of Jesus Christ of Latter-day Saints put on numerous outdoor theatrical productions each year. These pageants told the story of Jesus Christ and his divine role and mission, enact stories from the Book of Mormon, or portrayed stories from Church history. The pageants were generally started by local Church leaders in places where certain historic events took place or near Mormon temples. A narrator usually tells the story. Sometimes the music is provided by a live on-site symphony, but most of the pageants use originally composed music that is prerecorded and then broadcast over an audio system. Church member volunteers perform the pageants. Admissions to pageants is free and anyone is welcome to attend. Most pageants start after it is dark enough outside to use lighting equipment. In an official statement from The Church of Jesus Christ of Latter-day Saints, it was announced which pageants would continue and gave dates for the ending date for some pageants. The Church of Jesus Christ of Latter-day Saints is growing across the earth. As this occurs, local Church leaders and members are encouraged to focus on gospel learning in their homes and to participate in Sabbath worship and the Church’s supporting programs for children, youth, individuals and families. The goal of every activity in the Church should be to increase faith in the Lord Jesus Christ and to share His gospel message throughout the world. Local celebrations of culture and history may be appropriate. Larger productions, such as pageants, are discouraged. As it relates to existing pageants, conversations with local Church and community leaders took place in October 2018 to appropriately end, modify or continue these productions. Jesus the Christ is performed in Mesa, Arizona. The focus of this pageant is a reenactment of Jesus' life as told in the King James Version of the Bible. This pageant began as a sunrise service to commemorate the Atonement of Jesus Christ and His Resurrection and has become an annual pageant. According to the official announcement, the Mesa Pageant will continue under area leadership in 2021 following the renovation of the Mesa Arizona Temple. Throughout their history, the British people have demonstrated their desire to do God’s will, requiring personal sacrifice and tremendous courage. This pageant will tell the story of Latter-day Saints who have sacrificed much to build their faith and to strengthen their communities. Through their abiding faith and deep love for one another and the Savior, the Saints discovered their lives were full of the joy of the gospel. They taught their children, and these youth carried on a legacy of devotion to the principles of the restored gospel, which is manifest throughout the worldwide Church. Today, families and youth in the British Isles know this joy and continue to take it to all the world. The pageant will explore events surrounding the beginning of the Church and the impact of these events through the years in the British Isles. This pageant has been discontinued. It was located in Castle Dale, Utah, and was an historical reenactment of the settling of a pioneer village. The event followed a family as they began homesteading on new land and explained some of what members of the Church of Jesus Christ believe as settlers taught a Native American family about the gospel. Before the pageant visitors could also visit Pioneer Village, which teaches the crafts and vocations that were needed to make a new settlement work. This pageant has been discontinued. Martin Harris: The Man Who Knew was performed in Clarkston, Utah. Set in the 1800's, the pageant told the story of Martin Harris, who risked all he had to finance and print the Book of Mormon. He was also one of the three witnesses to see the gold plates and bear witness of the truthfulness of the Book of Mormon. This pageant will continue through 2020. America's Witness for Christ was performed in Palmyra, New York. It tells the story of God's people in the Americas found in the Book of Mormon. This was one of the largest pageants with a cast of about 650 costumed members. This pageant will continue through 2019. It was presented in Manti, Utah, at the foot of the Manti Temple. This pageant began with scenes from the Book of Mormon and told the story of Joseph Smith and the struggles his followers endured to practice their beliefs. The Nauvoo Pageant will continue with support from Church headquarters. This pageant is performed in Nauvoo, Illinois. A new pageant was created in 2005 to commemorate the life of Joseph Smith. It is a spectacular sight to see along with the other free attractions offered in Nauvoo. Every year since 1987, the Newmarket ward in Ontario, Canada, partners with the Town of Newmarket (and other sponsors) in presenting an outdoor nativity pageant with speaking roles and live animals. It is held for the four nights before Christmas, with two performances from December 21 through 23, and one performance on Christmas Eve. Between 80 and 100 volunteers of both ward members and local residents participate. The ward also partners with the city on other projects, such as park, forest, and graffiti clean up. Performed in Oakland, California, this pageant included a full symphony orchestra, 450 voice chorus, dancers, stage chorus, soloists, and actors. Through these talented individuals the story of Christ's Church was told, starting with Christ and His teachings down to the restoration of the Church and Joseph Smith. 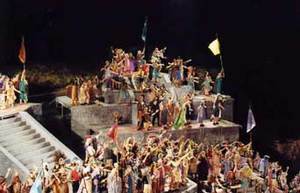 The Church suspended production of The Oakland Temple Pageant in 2007. This page was last edited on 12 December 2018, at 13:12.